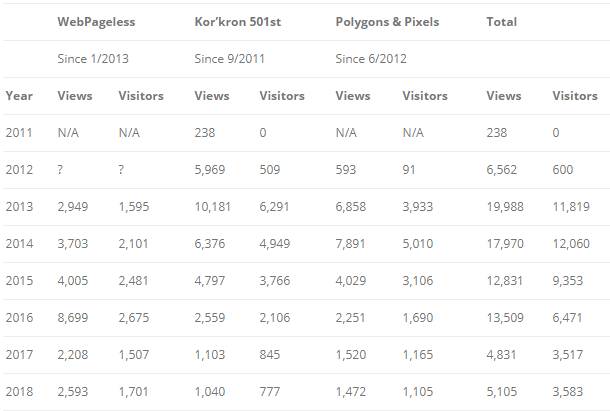 This past year was the best I’ve had on WebPageless for both views and visitors. Not counting any homepage, the top entry was “Pan-frying Pizza Rolls with Totino’s x MBMBaM.” That was a fun post! My Sample Works page came next. As expected, most views came from the US. Following my home country was Brazil, Russia, and the Philippines. I have a little more commentary on Polygons and Pixels and Kor’kron 501st as well. This entry was posted in WebPageless and tagged blog, blogging, kor'kron 501st, polygons & pixels, webpageless, wordpress on January 3, 2017 by TheUser.